We send Stacy our best wishes for a rapid recovery, in print, because we can't draw a banjo let alone a pig. Hey folks, Chris here and I will be in Greenville SC this Saturday at the SC ComicCon! I will have Team Cul de Sac and the Art of Richard Thompson books on hand for you to purchase for Arbor Day or any other holiday. Robert Young puts on a mean show and after the show we are having a Drink and Draw to Honor Jeremy Dale. Half the funds will go to the Heroes Initiative and and the other half to TCDS for the Michael J Fox Foundation. I will have already donated art at my table for you to get a jump on spending your art alloence this weekend. The Art of Richard Thompson and how that book came about. Ask about the new NEW book project. The Michael J Fox Gala coming up in April in NYC. Why Bill Watterson puts up with all of Richards friends. Favorite Artists of mine and yours. Why am I surrounded by guys named Chris at this show. Why my Kid wants a drawing of Hobbes eating Andy Runtons Owly. How Awesome Heather and Seth are helping at Heroescon. Or maybe we can discuss who is stronger the Hulk or Superman. Just come by, I will keep you entertained and you can keep me entertained! Richard Morgan has a comics store in Greenville, SC. He goes to most of the conventions in the area including Heroes Con. He met us the first year we sold t-shirts and Alice prints for fundraising. He's supported us every year because of his dad. His father passed away this morning from PD complications. I spent the afternoon with his dad on last year's Free Comic Book Day. He thanked us for what we do and told me how much it means to him to see us raise money through cartoons. When I saw Richard last month, he also thanked us and told me how much TCDS efforts mean to his family. Team Cul de Sac sends its condolences to Richard Morgan and his family. 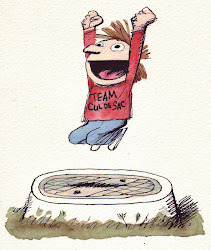 Team Cul de Sac will be at SC Comicon March 21, 2015! 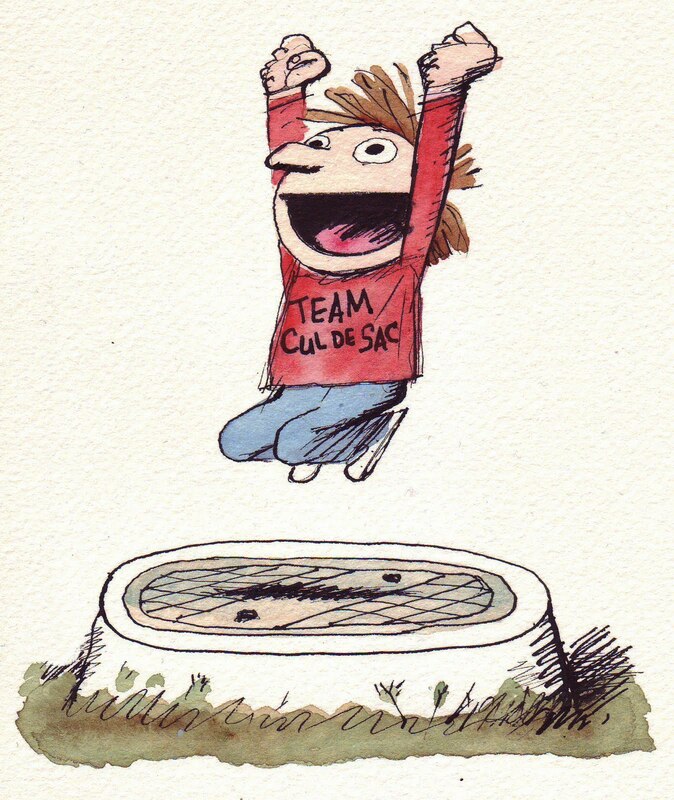 Team Cul de Sac is going regional! This month we'll be going to Greenville, South Carolina for the first annual Jeremy Dale Drink and Draw at SC Comicon. Jeremy was a wonderful artist who passed away suddenly in November and a friend of Team Cul de Sac who participated in our HeroesCon Drink and Draws. We're sad that he's no longer with us and hope to do him proud at this new event. We're also very supportive of his wife, Kelly Dale, and her selected charity, the Heroes Initiative. Heroes Initiative is great charity that assists comic book creators in need from emergency medical assistance to everyday essentials. If you've never been to a Drink and Draw, you are in for a fun event. You don't have to drink or draw to have a good time and help raise money for two fabulous charities. Anyone is welcome to participate in the drawing. SC Comicon has generously provided coasters and boards for the event (although we won't say no to a donation for use of these) and artists of both professional and amateur status will be donating their works created that evening for you to purchase. Chris and Heather will be on hand to facilitate both the drinking and drawing as well as answer any questions you may have about Team Cul de Sac. Chris will also have copies of The Art of Richard Thompson and Team Cul de Sac: Cartoonists Draw the Line at Parkinson's. The Drink and Draw will take place Saturday, March 21, 2015 from 7pm to 11pm at Quest Brewing located at 55 Airview Drive, Greenville, SC 29607. This is following the first day of SC Comicon which is from10am-6pm on Saturday and 12pm-6pm on Sunday. To donate to TCDS use the link below!